Teachers in England should not be banned from membership of the British National Party or any group which may promote racism, a review has concluded. 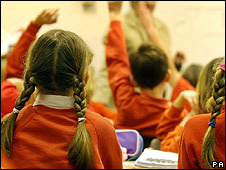 The government commissioned the report last September after a leaked list identified 15 BNP members as teachers. Review author Maurice Smith added his recommendation should be reviewed every year, which ministers have accepted. BNP leader Nick Griffin welcomed what he called a "common sense review" and said it was a great day for democracy. Members of the BNP are barred from the police and prison service. Mr Smith, a former chief inspector of schools, said a ban on BNP members in schools would be "taking a very large sledgehammer to crack a minuscule nut". "I do not believe that barring teachers or other members of the wider school workforce from membership of legitimate organisations which may promote racism is necessary at present," he said. Such a move would be a "profound political act", he said, and there was no consensus on the issue. He said existing measures to protect children and young people from discrimination or political indoctrination were comprehensive enough to mitigate the risk, although some could be improved upon. Mr Smith said there was currently "insufficient evidence of risk" to justify a ban on teachers joining organisations such as the BNP. He said: "Although police and prison officers are banned, to ban more than half a million teachers - or six million public servants - from joining a legitimate organisation would take this to a different scale of magnitude." He also said any ban was likely to be challenged in the courts by the BNP. 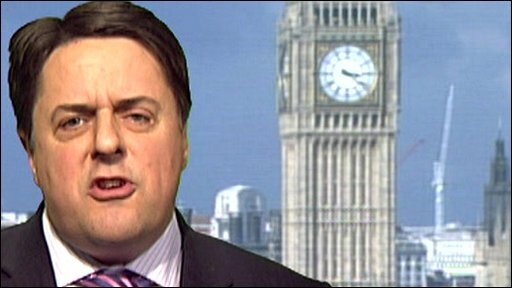 Nick Griffin: "Teachers shouldn't be involved in politics"
Schools Secretary Ed Balls has asked for a further review of the measures in place in independent schools to prevent the promotion of racism. Concern has been raised about independent schools staffed by unqualified teachers. Mr Balls said he wanted to know if the current situation struck "the right balance between allowing independent schools autonomy, operating in accordance with their ethos and values, and protecting the young people attending those schools from teachers displaying racist or intolerant views or behaviours that could be harmful". He said there was "no place for racism in our schools" but that the report made it clear that incidences of teachers promoting racism were "extremely rare". British National Party leader Nick Griffin said: "Today is a good day for British democracy. Under a BNP government, there would be no employment prohibitions placed on anyone based on political beliefs. "All teachers should, however, keep their politics strictly separate from the classroom. Should we ban teachers from BNP? "Several cases have come to light in recent times where leftwing teachers have been exposed promoting their own brand of politically correct politics in the classroom, with no action being taken by educational authorities. This is clearly wrong, and should not be tolerated. "Schools should be fountains of learning and study not indoctrination centres," said Mr. Griffin. The NASUWT union, which has campaigned to have BNP members banned from schools, said it was disappointed by the review's findings. General secretary Chris Keates said the report was "an opportunity that's been missed" to bring teachers into line with police and prison officers. "The idea that a person who signs up to membership of the BNP can simply leave these beliefs at the school gate and behave as a 'professional' when they walk into school is risible, " said Ms Keates. "The report is woefully inadequate and littered with contradictions." She said too much attention was paid to the number of incidents in schools, saying "one incident is one too many". Conservative education spokesman Michael Gove said: "The Smith review fails to get to grips with the problem extremism poses to our children. BNP members and other extremists should not be teaching in our schools and shaping young lives. Schools are bound by race relations law to 'eliminate unlawful racial discrimination'. State-funded schools in England also have a legal duty to promote community cohesion and to make sure the curriculum promotes the development of pupils and society. Because the BNP is not a proscribed organisation, banning teachers from joining it would be contentious, and as Mr Smith, the report's author said, open to legal challenge. He said the difference between the case of teachers and that of the police and the prison services - which have a ban on BNP membership - was that those bans had come in "after serious incidents", including the Stephen Lawrence inquiry, which had led to a public loss of confidence. There were also differences in the scale of the workforces - and in the nature of the work. The police and prison services were both "coercive" services, where officers often worked in isolation, he said. "Head teachers and governors need to be given the powers they need to dismiss extremists in the classroom without having to wade through bureaucracy and, crucially, we need a much sharper focus on improving inspections to deal with schools that have extremist links." Only six incidences of BNP membership by members of the teaching profession or governors were brought to the attention of the Department for Children, Schools and Families in six years, the report said. In the past six years the General Teaching Council for England has taken disciplinary action over teachers holding racist materials or using racist/potentially racist language in nine cases. Three cases led to a teaching ban. The Association of School and College Leaders welcomed the findings. Its general secretary Dr John Dunford said: "Of course people with racist views should not be working with young people in schools. However, it is much less clear that there should be a blanket regulation on the issue. "The aim should be genuinely to challenge young people to think for themselves and to form their own opinions rather than to promote a particular ideology." The review into independent schools will report in September.